Published for the first time. The manuscript of Bhagavad-gita As It Is. This is the “original manuscript” referred to by Jayadvaita Swami which he uses to justify the BBT changes to Srila Prabhuapda’s Gita. this manuscript is not the authority, the published book is the authority. However out of interest we have decided to publish the “original manuscript” also. Wow! This is quite a scoop! Jayadvaita Swami has had plenty of opportunities to publish these but hasn’t done so. It will be interesting to know what he has to say about this. Thanks so much for posting this nectar. I assume the masters for chapters 14, 17 and 18 are missing, right? There is no manuscript available for these chapters. Actually this is not really the “manuscript” at all. It is an early draft of the book. Srila Prabhupada personally worked on this early draft with Haryagriva to produce the actual manuscript which was presented to Macmillan for printing. That is the real “original manuscript.” And that is almost identical to Srila Prabhupada’s original Macmillan Gita. What about the original dictation tapes ? where are they ? I am so very glad that the Original Version of Srila Prabhupada’s Bhagavad Gita As It Is has been made available. When I found out the post-1978 material was changed and edited, I had to discard it. I now own the original edition and must say it is so wonderful to read what Prabhupada actually had to say rather than read what others deemed he was meaning. Do we have this “original manuscript” now? I mean, if Prabhupada read and approved this manuscript before MacMillan published it, then how can anyone want to go back to the draft? It is very good to hear from you Prabhu. It is not the manuscript that was submitted to the printers but more like the original transcription of Prabhupada’s dictation tapes and I am sure a lot of work went into refining this into the actual manuscript which was finally presented to the printers which as you testify was practically the same as the printed book obviously. And even Prabhupada and Hayagriva worked together on the Gita manuscripts for two months or more in San Francisco. So it is not that it was just Hayagriva polishing the manuscript, Prabhupada was working with him personally on the manuscript. Dear Ajit Krishna Prabhu, I cannot agree with you more! The “manuscript” is not the “drafts” that Jayadvaita has, what Jayadvaita has is simply one version (of possibly many) ROUGH DRAFTS. It is insanity to go back to those drafts after the finished approved of finalized “Complete Edition” was published and personally read from by Srila Prabhupada! The manuscript (“man·u·script: the original text of an author’s work, handwritten or now usually typed, THAT IS SUBMITTED TO A PUBLISHER”. from: http://dictionary.reference.com/browse/manuscript) is what was sent to MacMillan to be turned into the hard copy book that is published and distributed. What JAS has is a draft. So to revert all the work that SP (or empowered hayagriva to do) put into the final book is down write offensive and stupid! Thats all. I can not believe that any one in their right mind will accept such insanity as Jayadvaita is proposing. Second guessing Srila Prabhupada the Paramahansa Pure devotee of Krishna and using his conditioned imperfect mind and senses to revert a finalized transcendental work to a previous draft, with no shred of a direct order to do such a thing, is a serious offense and gross misunderstanding of the basic philosophy of Krishna Consciousness. You are a very brave and honest brahmana. I can only think Srila Prabhupada is VERY pleased with your work. You are really doing god’s work by telling us neophytes about such a level of deceit that Jayadvaita has done (his name reminds me of Jayadratha for some reason). I posted on one of your threads about how to get the original books and i will await your reply , i also wanted to know if there is any way that i can verify the authenticity of the books written by our beloved spiritual master when i am purchasing them. God bless u really because had i not stumbled on your articles i would have been grossly misled , i will be going to our ISKCON centre here in Jaipur tomorrow and discuss this further with their president. Thank u so much for this , u have my utmost respect. 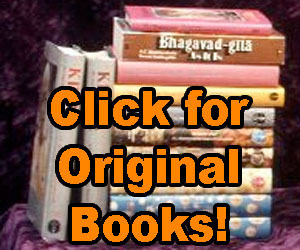 The original Prabhupada books you can get from http://www.KrishnaStore.com and you can read them online at http://www.PrabhupadaBooks.com. I’ve been looking at your site and reviewing some of their items, all very interesting, indeed. I looked at the manuscript have been published, it is true that this does not justify the changes to the original 1972 text of Srila Prabhupada. However, I have a question that I hope will help me to clarify. Did Srila Prabhupada authorize those modifications?? It is not a ‘manuscript’ it is a first draft. When you write a book you start by writing a draft and then you edit it and polish it and then when it is a state where it is finished and ready to be presented to a publisher to be printed that thing that you present to the publisher is called a manuscript. So this is only a fist draft. Srila Prabhupada worked with his editors to polish this draft and turn it into a manuscript. The editing was done under Srila Prabhupada’s direct supervision and everything was checked by and approved of by him. So this first draft actually has no authority at all. What has the authority is the final published book that was approved by Srila Prabhupada, that he read himself daily for more than ten years, and that he gave all of his classes from. There are a few actual real errors in the book, maybe 10 or so, and Srila Prabhupada himself pointed out at least 2 errors that he wanted corrected. But Prabhupada’s principle is “no changes” and Jayadvaita has made thousands of completely unauthorized changes that destroy the way the book reads. Prabhupada’s original Gita is in beautiful, well-edited English, Jayadviata has destroyed this beautiful English and in many places replaced it with horrible English that clouds the clear meaning of the text from the original edition. So Jayadvaita is what Srila Prabhupada was fearing most. Prabhupada’s greatest fear was that after he left someone would come along and make unauthorized changes to his books, they would remove bona fide things and introduce non bona fide things. And that is exactly what Jayadvaita is doing. He has made it his life’s mission to destroy Srila Prabhupada’s books. Prabhupada did not allow any changes at all to any aspect of his books on principle. Jayadvaita has changed everything. Thousands of changes where there is absolutely no reason to change the book at all. There are a handful of changes he can make a reasonable argument for, but 99% of his changes are simply change for the sake of change. There is no error in the original book that needs to be corrected, yet still Jayadvaita changes. He is change, change, change, change everything. And Prabhupada’s order is “NO CHANGES”. The rather obvious nature of the manuscript which is herein provided, acclaimed as the “original manuscript” by Jayadvaita is in fact an old, outdated, manuscript. As a publisher, I wouldn’t call said document manuscript and use it as the basis for printing thousands of books. And yes, the Macmillan edition has a handful of some rather obvious errors. We don’t contest that. That person who possesses such a consciousness to believe that his spiritual master would make thousands of errors is his published books certainly occupies a hellish position in relation to him. Thank you Madhudvisa, your service is priceless. What´s going on in a disciple´s head when he (incorrectly)try to change his guru´s Sanskrit title to one of the chapters in Bhagavad gita? Even in the Monier-Williams Sanskrit – English Dictionary it is stated that: “Sankhya-yoga – application of the sankhya doctrine to the knowledge of spirit, name of and chapter of the Bhagavad gita”. Dhyana is just one of the stages in ashtanga-yoga; meditation. Prabhupada: “Thus end the Bhaktivedanta Purports to the Sixth Chapter of the Srimad-Bhagavad-gita in the matter of Sankhya-yoga Brahma-vidya”. My blessings to Madhudvisa d. and others who work for returning to Prabhupada´s authorized books. It is almost as if the 1972 book should be called the english version and like it was translated into spanish and other languages there could have been an AMERICAN translation…on the shelf next to the english version. Who knows? A long time has passed since 1972. But a publisher publishes the manuscript that is submitted by the author. So you know the manuscript that you submit to the printer, that is what they print. So actual original manuscript is the printed 1972 Bhagavad-gita As It Is. That is what Srila Prabhupada approved and personally gave all his classes from and read from daily. So the original 1972 Macmillan Complete Edition is the “Original Manuscript”. Thank you Madhudvisa Prabhu, I appreciate your reply and agree with what you say. All Glories to Srila Prabhupada. Hari Bol Prabhuji! Please accept my humble obeisances, All glories to Srila Prabhupada! I was wondering, where in the Bhagavad Gita (in which chapters, verses), does Srila Prabhupada say to establish farm communities? Also, do you advice us to live in the cities or to live in farm communities? Srila Prabhupada does not say we should establish farm communities in Bhagavad-gita, but Gita talks about the occupation of the vaishyas, who’s business is agriculture, cow protection and business. Bhagavad-gita is introduction. You will find more details in Srila Prabhupada’s other books and lectures, letters, etc. Now we have to preach and make devotees. The idea of living on a farm has been always a total failure in ISKCON. Because somehow ISKCON farms attracted lazy people who were not at all interested in farm work. So it is pointless trying to start a farm if you don’t have any farmers. So if we want to start farms we have to first make farmers devotees.. So our main business is to become Krishna conscious wherever we are at the moment and then to preach to the others around us. There is no need to change our position in life, live on a farm, etc, to become Krishna conscious. We can become Krishna conscious anywhere. Another question regarding: Chapter 18, vers 44. What did Srila Prabhupada mean? Was it cattle raising or cow protection? Cattle are raised to be slaughtered in the slaughterhouses. Cow are meant to be protected, not raised for slaughter.